Wolf Called Romeo author Nick Jans! In his book, A Wolf Called Romeo, Nick Jans tells the unlikely, but true story of a six-year friendship between a wild, oddly gentle black wolf and the people and dogs of Juneau, Alaska. Meet the author this Friday at 11:00 AM at Fireside Books in Downtown Palmer. We are very excited to present author Nick Jans as he talks about his book A Wolf Called Romeo. This remarkable true story of a six-year friendship between a wild, oddly gentle black wolf and the people and dogs of Juneau, Alaska, is part memoir, part animal narrative, and a beautiful if heart-wrenching account of man's relationship with wild animals. The wolf, nicknamed Romeo by the locals, returned again and again to interact with the people and dogs of Juneau, living on the edges of their community, engaging in an improbable, awe-inspiring interspecies dance and bringing the wild into sharp focus. At first the people of Juneau were guarded, torn between "shoot first, ask questions later" instincts and curiosity. But as Romeo began to tag along with cross-country skiers on their daily jaunts, play fetch with local dogs, or simply lie near Jans and nap under the sun, they came to accept Romeo, and he them. For Jans, a more than 30-year resident of Alaska, it was about trying to understand Romeo, then it was about winning his trust, and ultimately it was about watching over him, for as long as he or anyone could. Written with a deft hand and a searching heart, A Wolf Called Romeo is an unforgettable tale of a creature who defied nature and thus gave humans a chance to understand it a little more. Nick Jans' new book is the awe-inspiring account of Romeo, a lone black wolf and his six-year friendship with an Alaskan community. Initially received with trepidation, Romeo returned again and again, earning the trust of the town’s inhabitants and even their local dogs. Though Romeo arrived with an air of mystery and danger, he quickly became a beloved member of the town’s population, playing fetch alongside household pets or napping with Nick in the sun. A Wolf Called Romeo is about trying to understanding this wild creature, winning his trust, and watching over him, for as long as Nick or anyone could. 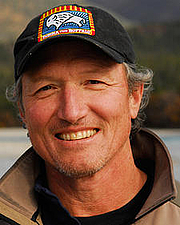 Nick Jans is an award-winning writer, photographer, and author of numerous books, including The Grizzly Maze. A longtime resident of Alaska, he has studied and photographed wolves for more than thirty years. He is a contributing editor to Alaska magazine and has written for a variety of publications, including Backpacker and the Christian Science Monitor. Nick Jans discusses The Last Light Breaking and The Grizzly Maze. Nick Jans's book A Place Beyond: Finding Home in Arctic Alaska (2nd ed.) was available from LibraryThing Member Giveaway. Nick Jans is currently considered a "single author." If one or more works are by a distinct, homonymous authors, go ahead and split the author. Nick Jans is composed of 2 names. You can examine and separate out names.